“Collaboration of the two oldest flea markets in the City in the opening of a new market, U Street Flea, was announced jointly today by Michael Berman, President of Diverse Markets Management (DMM), operator of The Flea Market at Eastern Market on Capitol Hill, established in the early 1980s and Michael Sussman, founder of Georgetown Flea Market, opened in the mid 1970s. Located at 912 U St. NW, a parking lot near the intersection of U and 9th Streets, NW, the market will feature a diverse mix of arts, crafts, imports, antiques and collectibles 10 a.m. to 5 p.m. every Saturday and Sunday, according to Berman, whose DMM will manage the market, on space licensed to Sussman by the City. “We’re very excited to be working with the “Dean of D.C. Fleas’ for the first time,” exclaimed Berman. “And we hope this is just the beginning of a long term relationship” between the two management teams. 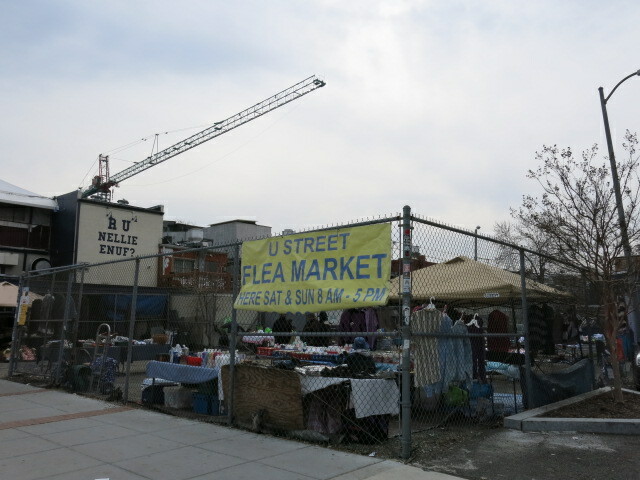 Sussman first opened U Street Flea at the beginning of March but decided “to ask DMM to help out” shortly thereafter. A previously-scheduled grand opening and ribbon cutting by Ward One Councilman Jim Graham will be held 12 p.m. Saturday, the first day under DMM management. DMM Director Tom Rall, who began to manage The Flea Market at Eastern Market in 1984, was especially pleased with the new relationship with the Georgetown flea. “I actually got my start in the antiques business as a dealer at Georgetown in the late 1970s, so DMM is actually a business which incubated there.